If you don't plan on redeeming Ultimate Rewards for travel, buying gift cards while there's a promotion is a good alternative. To see the eligible gift cards, login to your Chase Ultimate Rewards Portal and click the Gift Cards menu item at the top. The cards flagged with "deal" qualify for the promotion. Citi recently sent out an email to select cardholders to get $10 off at Amazon.com when you make your eligible Citi card your default 1-Click payment method. This promotional offer is valid for a limited time only or while supplies last. Credit must be redeemed by 11:59 p.m. PT on July 31, 2018. The promotion will end at 11:59 PT on 11/30/2018. Starbucks Rewards members can get 3 months of Spotify Premium for $0.99 when you try Spotify Premium. You'll also get 125 free Stars that can be redeemed for one food or drink item of any size. Starbucks Rewards is Starbuck's loyalty program, and it's free to enroll. The offer expires on June 14, 2018, or until 210,000 offer redemptions. After the 3 month Spotify trial, the pricing goes back to $9.99/month. We decided to launch a podcast on 360 by Mandy to elaborate on select topics. Our first episode is a casual conversation about store credit cards and the most frequently asked questions we receive about them. The podcast is a 360 video because we figured walking around is more interesting than staring at us talking for 30 minutes. If you have a stash of Delta Airline points, Delta is currently having a sale on flights to Europe. Travel dates are January 10-March 15, 2019. Good news for travelers going through LAX! 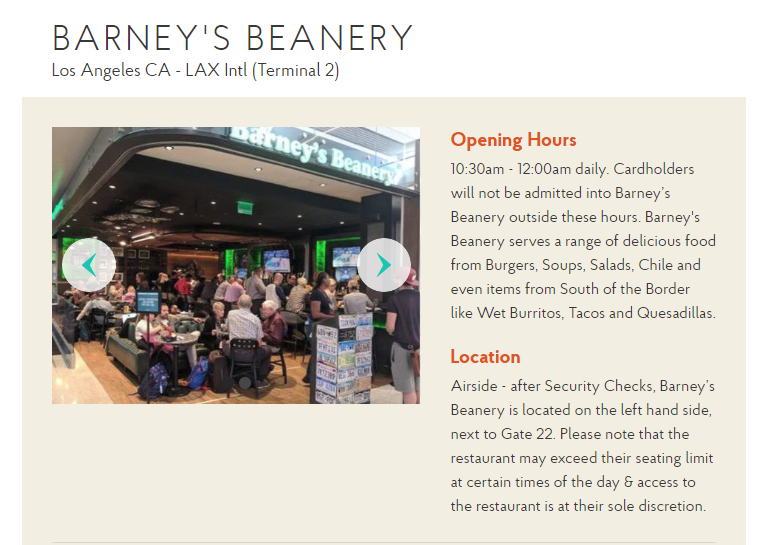 Priority Pass just added Barney's Beanery to the restaurant list. Priority Pass cardholders can use the benefit to receive $28 off the bill, plus and additional $28 for each guest. Be sure to check your credit card's benefit to see how many complimentary guests you have with your specific card. Gratuity is NOT included, so remember to carry cash. "We may also consider the number of American Express Cards you have opened and closed as well as other factors in making a decision on your welcome offer eligibility. " The terms are vague and up to interpretation, so we'll see what happens in the future. Data points are still needed to see if the terms are enforced.